When it comes to coffee retail chains, it’s easy to think of Starbucks as the number one, but who exactly is number two? Until this morning, as I sipped my Starbucks coffee, I would have never guessed it was Caribou Coffee, with nearly 500 locations in 16 U.S. states (compared to the 11,000-plus of Starbucks). Originally established in Minneapolis in 1992, Caribou’s main presence is in the Midwest and some lower East Coast states. I have, literally, gone into a Caribou only once in Atlanta and it was a fairly convincing experience as the brand relies heavily in a kind of ski lodge environment and look that makes you feel cozy and warm. The coffee wasn’t bad either. Over the weekend, Caribou announced a new identity crated by Minneapolis-based Colle+McVoy. 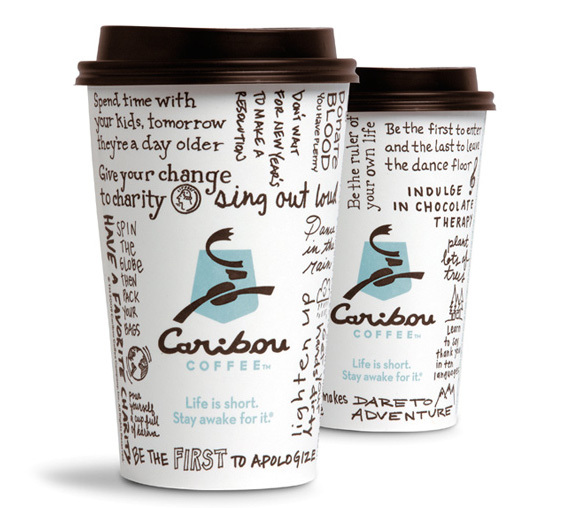 When approaching the logo redesign, we didn’t want to lose the important equities of the previous logo, so the new logo still includes a leaping caribou, a shield and the words “Caribou Coffee.” What has changed, however, is the look: from a Northern lodge theme to a fresh variation of the same elements, now rooted in natural textures and fluid graphics. “Because coffee is the heart and soul of our company, the body of the caribou is formed out of a coffee bean. In addition, the caribou’s antlers now form the shape of the letter ‘C’.” Another significant change in the logo is the direction of the caribou’s leap. While the Caribou in the previous logo was leaping left, the caribou now leaps right, signifying the direction the company is heading — into the future. “The shield element has been updated to resemble the shape of traditional national park signage. This is a nod to our founders’ hike in Alaska’s Denali National Park, where they were inspired to start the company,” said Alfredo Martel, senior vice president of marketing for Caribou Coffee. There are things to like and things to dislike in this refresh. The overall impact is indeed beneficial, as the old look and feel, well, it looked and felt right out of the 1990s with the chunky strokes and distress-ey typography. The handwritten “Caribou” follows today’s trends of the handcrafted and personal, so in a decade or two it might feel trite, but for now it works, especially in contrast with the über stoic use of Futura by Starbucks. The readability of the “a” is a little questionable, but the rest of the letters look as if a sophisticated lumberjack had scribbled them on a diner while eating pancakes — and I mean that as a compliment. The caribou itself is not as convincing and it’s trying too hard to carry meaning: Its body is a coffee bean! The antlers make a “C”! The shield is like a park sign! The angle of the jump signifies the expected revenue of 2010! Okay, I made that last one up, but in trying to do too many things with the icon, it becomes a little bit of an amorphous jumble. The new color palette is a vast improvement, I love the light blue and brown combo and it works great to separate Caribou further from Starbucks. The continued use of handwritten typography in the packaging is also nice, but I again wonder if it will be too much of the same as the brand attempts to sustain itself over the next few years — and the combination of quirky messages and scribbles has been more genuinely executed by the much, much smaller Puccino’s, and it’s also reminiscent of some of the materials produced by Quicksilver in recent years. 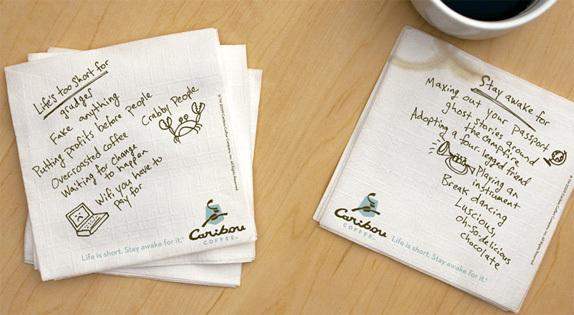 Nevertheless, Caribou needed a refresh badly and this is the right kind of direction and execution. Thanks to Nate Mueller for first tip. When it comes to coffee retail chains, it's easy to think of Starbucks as the number one, but who exactly is number two? Until this morning, as I sipped my Starbucks coffee, I would have never guessed it was Caribou Coffee, with nearly 500 locations in 16 U.S. states (compared to the 11,000-plus of Starbucks). Originally established in Minneapolis in 1992, Caribou's main presence is in the Midwest and some lower East Coast states. I have, literally, gone into a Caribou only once in Atlanta and it was a fairly convincing experience as the brand relies heavily in a kind of ski lodge environment and look that makes you feel cozy and warm. The coffee wasn't bad either. Over the weekend, Caribou announced a new identity crated by Minneapolis-based Colle+McVoy.